Where's my hair scrunchie gone? This is Nelly, you can't see her eyes, but she has got some! 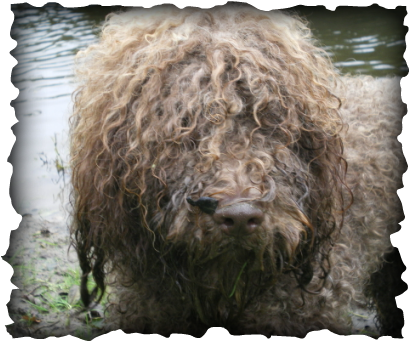 There have been a few cases of both entropion and ectropion, also distichiasis reported in the past in the Barbet, along with all the other breeds of dog too. If you live in the UK or Ireland, there are eye tests which are carried out by a small number of specialists. These tests concentrate on the actual eye, NOT the eyelid or lashes, where the conditions above are found. Update... it seems I must have been speaking to the right people, and for long enough! Relief.